From Sagar islands comes the news that over 30 lakh pilgrims from across the country and neighbouring Bangladesh and Nepal took holy dip at the confluence of the River Ganga and the Bay of Bengal on the occasion of Makar Sankranti on Tuesday, the state government said. 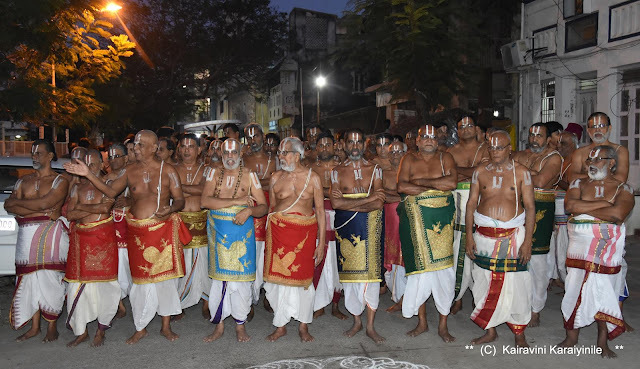 Panchayat and rural development minister Subrata Mukherjee said the pilgrims also offered prayers at the Kapil Muni Temple. 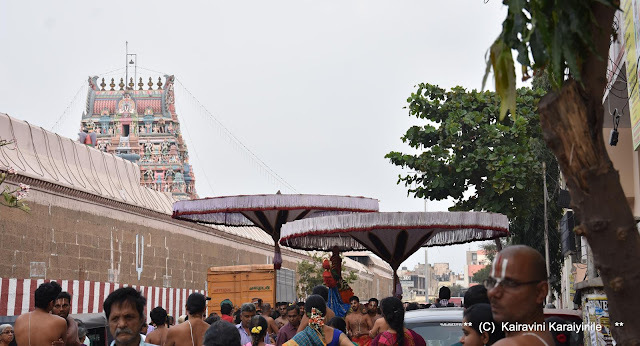 At a much bigger level is happening the ‘Kumbh mela’ – lakhs of devotees took a holy dip at the Sangam -- the confluence of the Ganga and Yamuna and the mystical Saraswati rivers -- this morning, on the auspicious occasion of Makar Sankranti and marking the onset of the Kumbh Mela. About 13 'akharas' are participating in the "Shahi Snan" with each being allocated about 45 minutes by the Kumbh authorities. 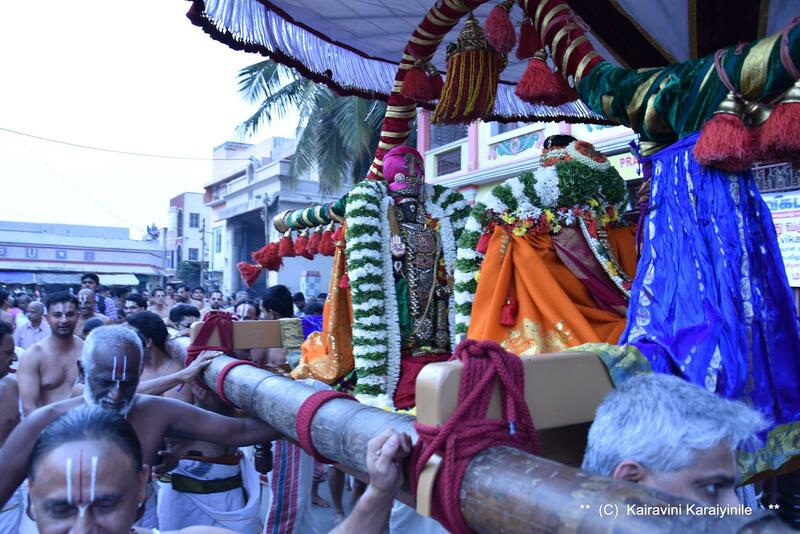 The ceremonial bath is drawing huge crowds as devotees continue to arrive here in large numbers. வெய்யதோர் தழலுமிழ் சக்கரக்கை வேங்கடவற்கென்னை விதிக்கிற்றியே. 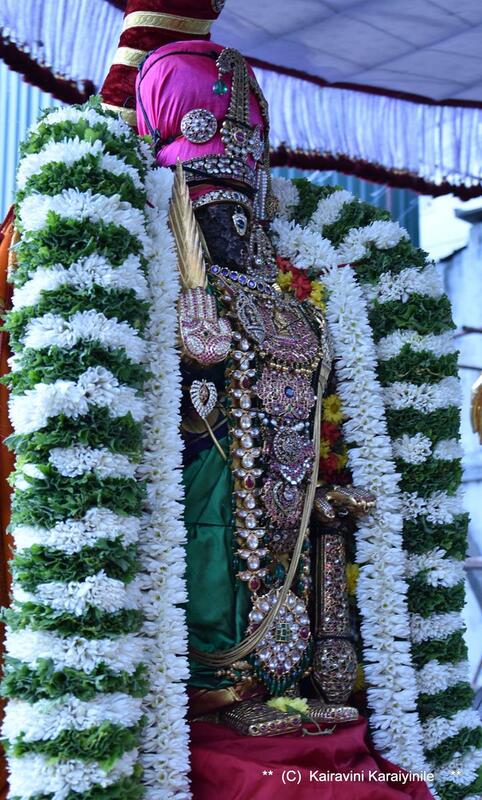 The month of Margazhi was all about Thiruppavai and nonbu. 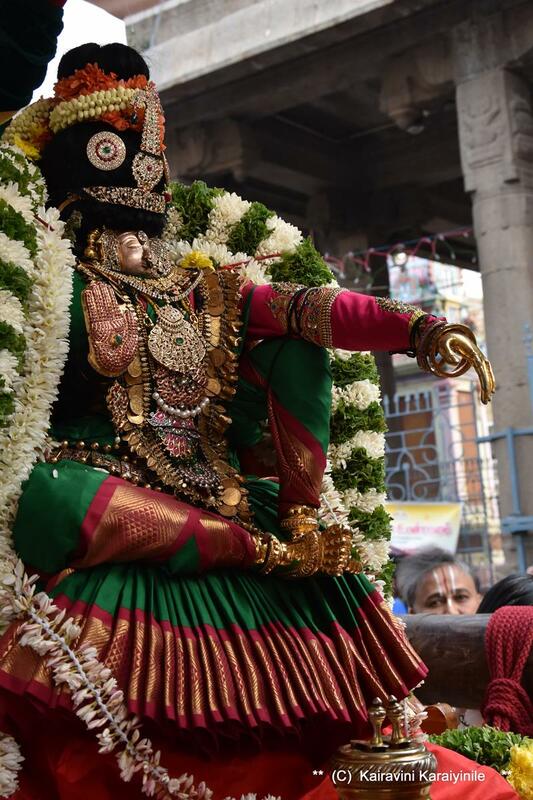 Andal’s other work is ‘Nachiyar Thirumozhi’ - Nachiyar is Devi; consort of Sriman Narayana. Thirumozhi is sacred saying. Andal has presented garland of flowers and garland of poetry to Lord. 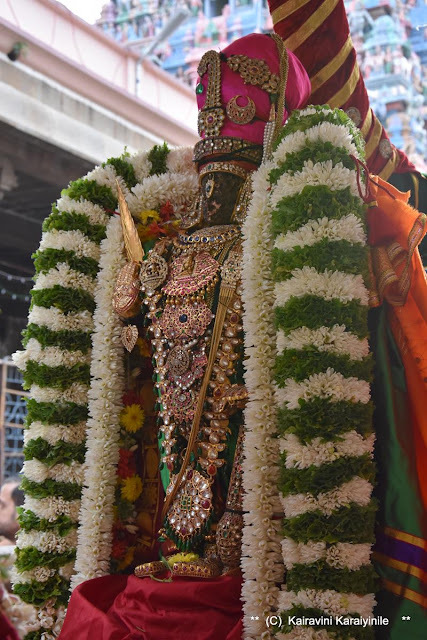 Now in the month of Thai, Andal sweeps the place, beautifies it, bedecks the place, worships for her union with the radiant Lord of Thirumala hills. Makar Sankranti marks the transition of the Sun into the zodiac sign of Makara rasi (Capricorn) on its celestial path. 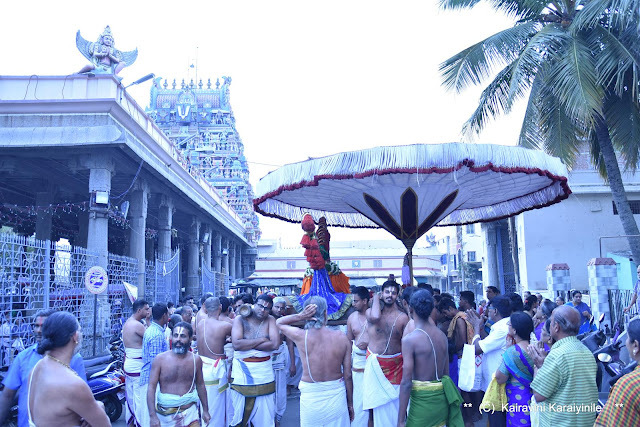 From today, it is the month of ‘Thai’ – which commences ‘Uttarayāyaṇa, a term derived from two different Sanskrit words "Uttara" (North) and "ayana" (movement) thus indicating a semantic of the northward movement of the Sun on the celestial sphere. 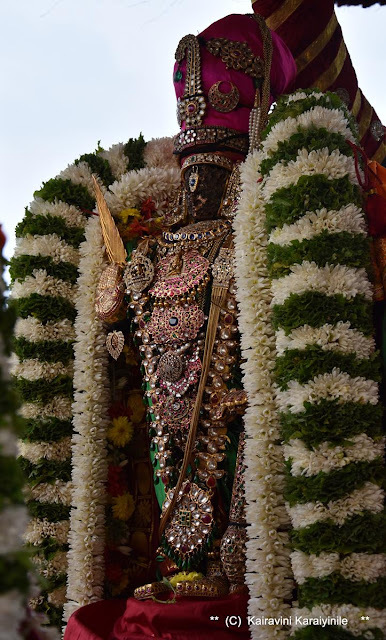 On ‘Bhogi’ ~ the day before the Pongal, it was the divine wedding of Sri Andal with the Perumal she idolized and sang in Her prabandhams. 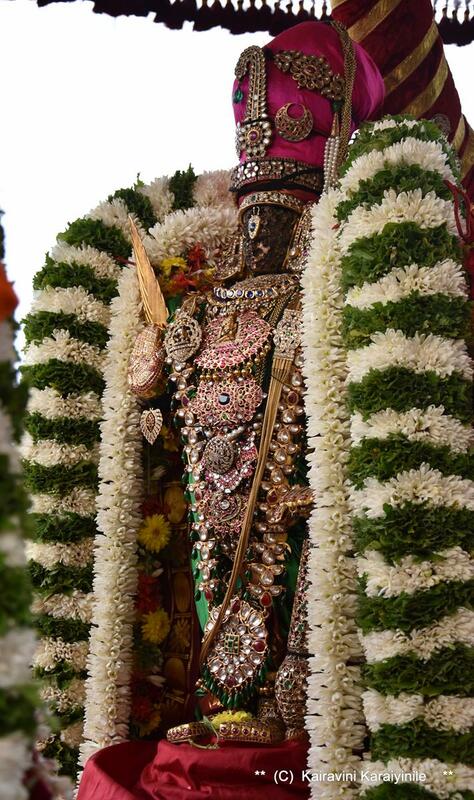 Andal Thirukkalyanam follows the Pavai nonbu and the 9 days of Neeratta Uthsavam. 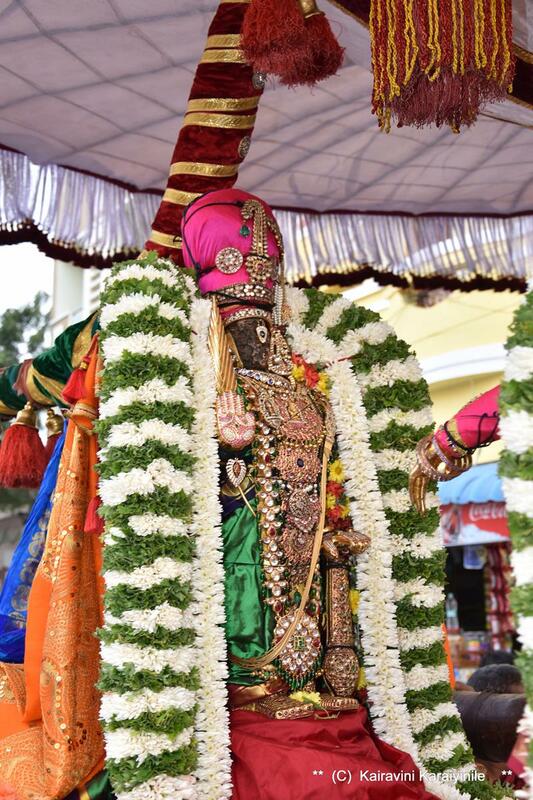 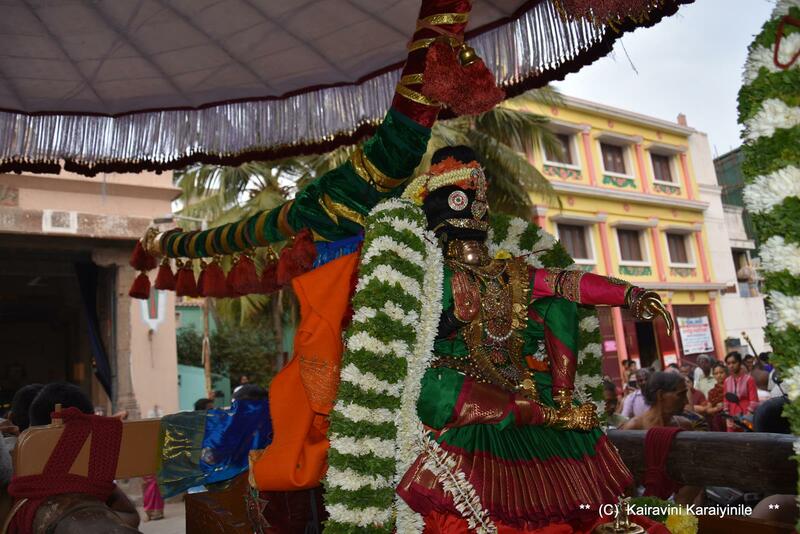 After the grand vivaham, today it was Sankranthi Oorgola Uthsavam. 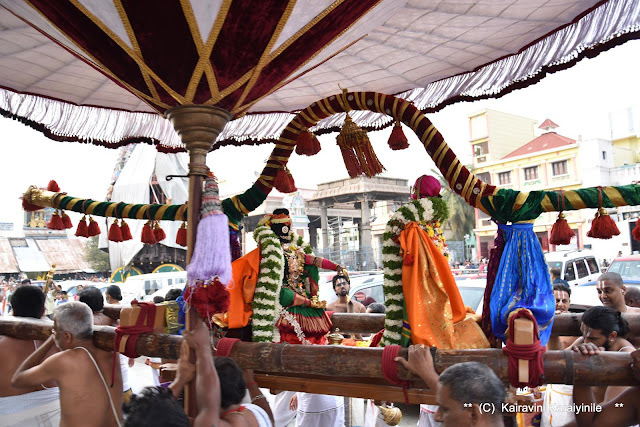 Today’s purappadu of newly wed Divya Thampathis - Sri Andal and Sri Parthasarathi grandly occurred in a special open palanquin [one that had no roof known as kooralam]. Sri Parthasarathi, was embellished with many dazzling ornaments adorning the Crown [Sigathadai]; Sri Andal in a beautiful sitting posture sat opposite to Him in the same pallakku.